Giant fighting robots, skeletal book keepers, and swordsmen await! It seems that 2018 is the year of tough choices for us here at Too Far Gone. With the start of another anime season it is once again time for me to dole out my top three choices to watch in this year’s fall season. However, narrowing it down to just three shows this season has been a difficult task. With new shows like Zombieland Saga, and Tsurune: Kazemai Koukou Kyuudou-bu, and returning favourites like Golden Kamuy, and Senran Kagura not quite making the cut you know that fall 2018 has a lot of potential. So without further ado, here are my three picks for the 2018 fall anime season. An anime adaptation of the 1993 tokusatsu series Gridman the Hyper Agent, SSSS.Gridman hopes to capture the hearts and minds of anime fans who grew up enjoying giant robots fighting kaiju monsters. Tokusatsu, is the Japanese term for live action shows and films which feature heavy use of special effects, a style we here in the West recognize as synonymous with the classic 1954 Godzilla, and the much more recent Mighty Morphing Power Rangers. 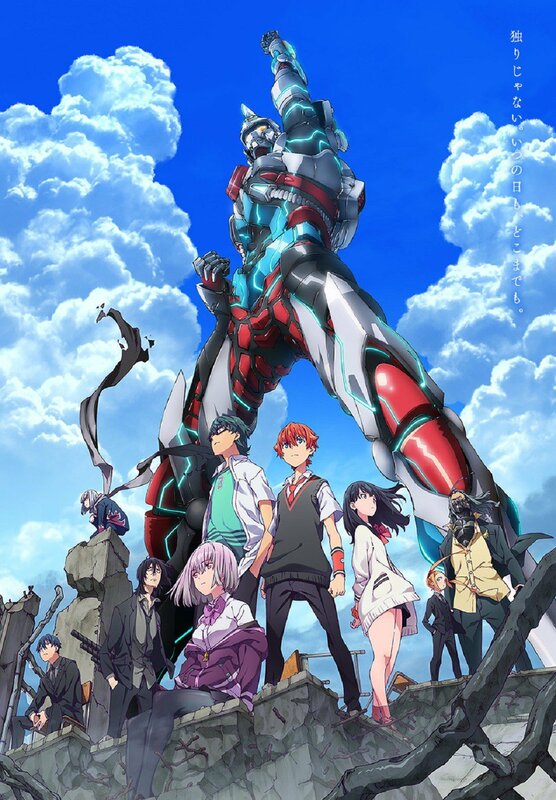 Produced by Studio Trigger and Tsuburaya Productions, SSSS.Gridman looks to be a fun action packed throwback to a time when the youth of today could save the future of tomorrow from the destruction of giant monsters. A short form comedy anime, Gaikotsu Shotenin Honda-san follows the day to day workings of your average skeleton man working at a book store. Originally a web comic on Pixiv, this anime adaptation tells the story of main character and author Honda, detailing his experiences working at a manga counter of a bookstore. The colourful cast of masked co-workers find themselves at the beck and call of both the books they must shelve, and the interesting customers you could only find in a Japanese book store. With its fun design and gut busting moments of customer-employee interaction, anyone who has worked in retail will get a kick out of this fun workplace comedy. I have saved my most controversial pick of the season for last in the newest season of Thunderbolt Fantasy. While not an anime, this masterful puppet show has just as much style and intensity as any show airing this season. This collaborative project between Japan and Taiwan brings a whole new experience to the grizzled, seasoned anime watcher. A fantastical wuxia-style period piece, Thunderbolt Fantasy tells the tale of Shang Bu Huan, a vagabond swordsman, whose carefree wanderings have led him into clashes between powerful warriors, demons, and other treacherous figures. With fights reminiscent of Crouching Tiger Hidden Dragon, Thunderbolt Fantasy delivers amazing high flying action, and beautifully orchestrated special effects to creating a magical experience the likes of which you probably have never seen before. To wrap up this amazing package we have the prolific Gen Urubochi (Madoka, Fate/Zero, Psycho Pass) serving as the show’s writer. If you want to see something completely different than your normal fare of anime, this is your top choice this season. In other news Yuru Camp, another anime we told you all to watch, has recently gotten cleared for some new upcoming works!